Rooftop solar works for Kentuckians. The legislative process didn't. At roughly 10:50 p.m. the night of the second-to-last day of the session, the Kentucky House of Representatives voted 50-38 to recede from the House amendment to SB 100. House leadership called the vote at the eleventh hour, thus breaking an established deal struck last month between House Democrats and Republicans to not vote on the bill without an amendment. The House then voted 55 - 36 to pass the unamended, bad solar bill. This incredibly disappointing outcome clearly represents a win for monopoly utilities, who funneled hundreds of thousands of dollars into this fight. But it also speaks volumes to the power of the grassroots opposition, and it's important to celebrate the victories of us champions of safe, good-paying jobs and clean, affordable energy for Kentucky. Several legislators spoke to the unfairness of this rushed process, and several more spoke to the incredible volume of calls/emails they received in opposition to this bill. Rep. Cluster Howard even noted that he was compelled to vote against receding from the amendment because, unlike all the communications he had gotten in favor of the bill from utilities and paid lobbyists, all the calls and emails he'd received in opposition to it were from ordinary Kentuckians and constituents. What's more, a handful of legislators even brought up the impacts of climate change on the floor of the House, which marks a huge narrative shift for Kentucky politics. We are the reason this bill, which was intended to be railroaded through three weeks ago, stalled for so long. We are also the reason the bill failed the two previous years and why utilities worked so hard to ram it through this year. We are proud of the work we've done, and determined to keep fighting for clean, affordable energy for all Kentuckians. As the bill moves to the governor's desk to be signed into law, please make sure you send him an email here, or a voicemail at 502-563-2611 to let him know what a mistake it would be to sign off on this job-killing, pro-monopoly bill. Then, let's get ourselves ready to take Action For Democracy, make energy a central election issue for 2019 and 2020, and vote these utility-backed elected officials right out of office. After weeks of non-movement, utility lobbyists are putting more and more pressure on the House to recede from the House version of SB 100 in the final two days of the legislative session, and to instead accept the Senate's terrible version of the bill. We've heard that the House will most likely vote whether or not to recede this week. We need to make sure they hold their ground. The legislative message line, 800-372-7181, is open from 7:30 a.m. to 9 p.m. (6 p.m. Fridays). You can also reach legislators by email at firstname.lastname@lrc.ky.gov. Visit this page for a list of target legislators to email, who are on the fence, and here for a full list of all representatives' emails. And if you're on Twitter, another basic action you can take is Tweeting directly at legislators. You can find a sample Tweet and a list of Twitter handles at bit.ly/SB100_Tweet. The representatives in bold are the highest priority. There are only two days left of this legislative session. Let's make sure we defeat this bill for the third year in a row! On the afternoon of 2/21, the Kentucky state senate voted not to concur with the House version of SB100–which is the only version of the bill solar advocates could live with. The original, unamended bill - which will kill solar jobs, stifle Kentucky's fledgling solar industry, and deny Kentuckians a say in where they get their energy - is now being sent back to the House for a vote. The House stood up to monopoly utility interests last week. We need to remind them to hold their ground. If they vote no on the unamended bill (in legislative terms, if they "do not recede from their amendment"), the bill will be sent to conference committee to hammer out the differences between the Senate version and the House version. But if they vote yes (in legislative terms, if they "recede,") the bad solar bill will have passed both chambers. Calls to the House are now urgent. The legislative message line, 800-372-7181, is open from 7:30 a.m. to 9 p.m. (6 p.m. Fridays). You can also reach legislators by email at firstname.lastname@lrc.ky.gov. A full list of our representatives' emails is available here. Please leave a message for "my representative, and all representatives." Suggested message: “SB 100 is a terrible bill that kills solar jobs and protects monopoly utilities. Do NOT recede on SB 100." Rooftop solar works for all Kentuckians. It creates good-paying, safe jobs and it helps Kentuckians reduce our bills and save energy and money. We want to make sure access to rooftop solar in Kentucky is expanded. SB 100, and the way in which it was rammed through both chambers of the General Assembly, was a utility power grab that will kill solar jobs and change the rules so that solar works only for monopoly utilities. The House Floor Amendment 1 to SB 100 does a lot to make the bill better. We now need to contact every state senator to encourage them to only pass SB 100 with House Floor Amendment 1. The Senate could vote on the amended bill as soon as tomorrow. The legislative message line, 800-372-7181, is open from 7 a.m. to 9 p.m. (6 p.m. Fridays). You can also reach legislators by email at firstname.lastname@lrc.ky.gov. A full list of our senator's emails is available here. Please leave a message for "my senator, and all senators." Suggested message: “Rooftop solar works for all Kentuckians. Please vote to approve the House version of SB 100." And remember: The amended SB 100 is vastly improved, and still imperfect. We want, and will continue working for, expanded access to rooftop solar in Kentucky. The morning of 2/15, the House passed SB 100 by 71-24. However, two amendments, filed by Rep. DuPlessis and Rep. Booker, were voted on in the floor of the House before the full vote. DuPlessis's amendment passed, and Booker's narrowly failed. Allows for third-party leasing of systems, which would help customers who afford the upfront costs of installing solar on their property. Opens the door for one, rather than multiple, cases before the PSC to set the rate for solar energy credits, and ensures that solar advocates have intervention rights – which is significant given that the current PSC has excluded low-income advocates from the KU/LG&E rate case. Removes language for "instantaneous netting." "Instantaneous netting" would have allowed the PSC to devalue all electricity fed into the grid, rather than just the excess energy a rooftop solar customer feeds onto the grid but didn't use each month. Requires that in setting rates for solar customers, the PSC consider a list of identified benefits of solar. However, where the amendment fails is that it continues to define net metering in terms of “dollar value” rather than kilowatt-hour credits. This opens up the possibility that rooftop solar customers be considered wholesale electric suppliers and thus, under federal regulation, be credited for excess energy at a lower, wholesale rate. The failed Booker amendment would have fixed this language, and it seems clear from the floor debate that utilities intend to argue this point in the future. The amendment also does not remove the hard 1% cap, so utilities can still stop offering net metering service once energy-generating capacity from net metered solar installations comprise 1% of load. Here's a two-sentence, non-technical summary of the newly amended bill: It make the process for determining how to credit excess energy produced by rooftop solar customers much fairer to both current and potential solar customers than the original SB 100 was. However, it also fails to address at least two notable ploys by utilities to undermine rooftop solar in the future. So, what happens next? This amended, improved, and still notably imperfect bill will now go to the Senate for an up or down vote. If they reject it, which they likely will, it goes back to the House for a vote whether to accept the Senate version. If they reject that, which they likely will, SB 100 goes to conference committee to "hammer out the differences." In conference committee, if they cannot agree on a reconciled bill, then a “free” conference committee is appointed. At that point, they really can make any changes at all to a bill. Whatever comes out of conference committee (whether "free" or not) goes to an up or down vote in both chambers. Thanks for all the incredible work, all, and stay tuned on action steps for what to do next. The House Natural Resources & Energy Committee met on the morning of February 14 to discuss SB 100. However, the committee did not have a quorum. Chair Jim Gooch called a recess, and later in the afternoon quickly reconvened them for an "emergency meeting." The bill passed 10 - 4 with three representatives (Travis Brenda, Jim DuPlessis and Jim Stewart) noting that they would vote to get it through committee now, but reserved the right to vote the other way in the full house, depending on if amendments were filed to address concerns they had. Six representatives – DuPlessis, Angie Hatton, Cherlynn Stevenson, Charles Booker,MCKenzie Cantrell and Josie Raymond – filed floor amendments to SB 100, which may slow it down. But it's still possible it could be brought to a full vote in the House Friday morning. This may still be our last chance to put a stop to this rushed-through, pro-monopoly bill. "We get tons and tons of calls from constituents asking us to support various bills, and SB 100 was no exception. The thing that was different about SB 100 though, is that I got tons of calls about this bill, and not a single one of my constituents asked me to support this bill." On February 13, utility-backed legislators pushed SB 100 through both the Senate Natural Resources Committee and the full Senate. In the morning it quickly passed the Senate Natural Resources & Energy Committee, was placed at the last minute onto the Senate Orders of the Day that afternoon (after a spur-of-the moment Rule Committee meeting), and passed 23-12 on the Senate floor (see how senators voted). Senate Republican leaders had the bill on the fast track to passage even before it was assigned to a committee earlier in the week. This maneuvering prevented a favorable amendment from Sen. Reggie Thomas from even being considered on the Senate floor. That same afternoon, the bill was reported in the House, and House Republicans pushed for the 3-day posting rule to be waived. It will be heard in the House Natural Resources and Energy Committee on Thursday, Feb. 14, at 9 a.m. If SB 100 passes out of that committee, it could be brought for a full vote on the House floor as early as the morning of Friday, Feb. 15. It's clear that Republican leadership wants to ram this through as fast as they can, so as to block out the voices of everyday Kentuckians. But it's not over until it's over. Legislators need to know this proposed bill is not a fix, and that the process legislators have been following has been neither transparent nor inclusive of solar advocates. Please a message for your state representative, House leadership, and all members of the House Natural Resources and Energy Committee. The LRC message line, 800-372-7181, is open from 7 a.m. to 9 p.m. (6 p.m. Fridays). You can also reach legislators by email at firstname.lastname@lrc.ky.gov. Kentuckians deserve clean, affordable energy, and a say in where it comes from. Say no to SB 100. Our vision for Kentucky’s energy future is about clean, affordable energy for all Kentuckians – no matter our race, age, gender or class. And it’s about so much more. It’s about Kentuckians having a choice in where we get our energy, and a government that backs us up in seeking that, despite the wishes of our monopoly utilities. It’s about reliable, safe jobs and energy bills that don’t make you have to choose between keeping the lights on or paying the rent. Two years in a row, utilities have spent a lot of money during our legislative sessions trying to push through a bad solar bill to cripple the growth of home-grown, rooftop solar energy – an option that more and more Kentuckians are turning to, as solar prices drop and utilities raise their rates. A version of that bad bill is back. And we need your help to fight it. Senate Bill 100 would put rooftop solar out of reach for most Kentuckians, crush growing small businesses across the state and stifle the creation of thousands of jobs. There’s so much our state legislature could be doing to support energy independence and a clean energy economy – but this bill takes us in exactly the opposite direction. Sen. Brandon Smith is sponsor to the bill, and Senate leadership is quickly advancing it. We anticipate that it will be assigned to the Senate Natural Resource and Energy Committee, which will next meet on Wednesday, February 13 at 11 a.m. in Room 154 of the Capitol. SB 100 re-writes the rules to favor monopoly utilities and restrict Kentuckians’ ability to choose where they get their energy. It does so by gutting an existing law, known as net metering, that gives qualifying solar customers in Kentucky a one-for-one credit for energy their rooftop systems provide to the grid. If passed, the bill would put rooftop solar out-of-reach for most Kentuckians. This bill was introduced February 11, and it’s important that we flood our legislators’ voicemails and inboxes, to send them a message that home-grown solar in Kentucky must be protected. Check out our “take action” steps for guidance on how to call, or contact Nikita Perumal at nikita@kftc.org or 502-554-6633 if you’d like to talk about other ways to get involved. Solar works for all Kentuckians, and it’s time our utilities did, too. Thank you for helping us hold them accountable. The legislative message line is open all week, 800-372-7181, from 7 a.m. to 9 p.m. (6 p.m. Fridays). Find your legislator here. Please leave a message for your state representative, state senator, and "all members of the Senate Natural Resources and Energy Committee." Suggested message: "Vote NO on SB 100. The bill crushes consumer choice and Kentucky's home-grown solar industry. It rewards monopoly utilities at the expense of residents, independent businesses and jobs. Solar works for all Kentuckians. It's time our utilities did too." Legislators can also be emailed at firstname.lastname@lrc.ky.gov. 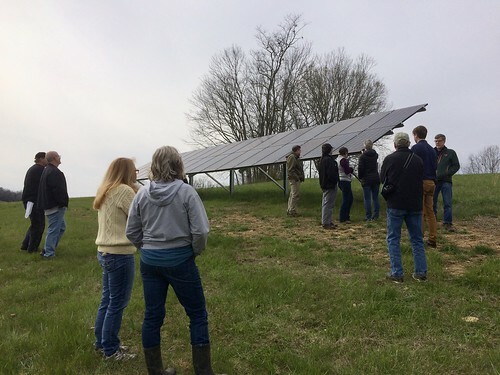 Sign up to lobby with KFTC and a coalition of solar allies in support of solar energy in Frankfort on Solar Lobby Day (February 28). Or, sign up for any other day that works for you. Help us pack the room at the upcoming Senate Natural Resources and Energy Committee meeting on Wednesday, Feb. 13 at 11 a.m. Contact nikita@kftc.org for more information. Support our work in Frankfort with a donation to become a member or renew your membership with KFTC. Net metering is the name for a popular state policy which gives customers a one-for-one credit on their utility bills for energy delivered to the grid by rooftop solar panels or by other forms of locally installed renewable energy. It is this policy that makes rooftop solar accessible for most Kentuckians, and allows farmers, low- and fixed-income residents, rural people, veterans, small businesses, schools and nonprofits to lower their bills and have a say in where they get their energy. Rewrite Kentucky’s net-metering rules so that monopoly utility companies – and not Kentucky’s residents, employers, workers or independent renewable energy businesses – benefit and profit from solar energy. End net-metering as we know it and and instead credit rooftop solar customers for the energy they produce at a rate determined by the Public Service Commission. This rate would likely be substantially lower than the current one-for-one rate under net metering, because SB 100 encourages the commission to consider only the costs claimed by utilities – and not the many benefits that net-metered solar energy systems deliver to utilities and all non-solar customers. Deny rooftop solar customers certainty over their investments through the possibility of changing compensation rates at the request of utilities. Grandfather in existing net-metered systems for 25 years. After this time, net metering will end for those systems, and owners will receive credits at the lower, PSC-determined rate. Read more about the specifics of SB 100 and why it is unfair and discriminatory. It’s worth noting that, as utilities seek to kill the policy of net metering, they also offer their own solar programs. It’s not that utilities are opposed to solar in Kentucky. They just want to make sure that they have a monopoly over it. SB 100 could bring homegrown rooftop solar, and the good-paying jobs that come with it, to a screeching halt across Kentucky, while ensuring that electric utility monopolies are the only ones permitted to benefit and profit from the power of the sun. Caps the total capacity of net-metered systems at 1% of a utility’s peak load, a fraction of what other states are already achieving. Provides no state tax incentives for customers who install their own renewable energy systems. Prohibits third party ownership of renewable energy systems, bans virtual net-metering (the ability to assign net-metering credits to other customer accounts), and prohibits independently owned community solar farms.